The first thing that springs to mind when looking for your perfect safari camp or wildlife reserve probably isn’t the food, but our list of top gourmet lodges across Africa might just change that. This delectable bunch of safari lodges for foodies have everything from high tea spreads fit for a King, posh picnics to the three-course feasts overlooking the rolling savannah plains. Best buy those safari trousers in one size larger! If you like your food to be creative, artistic and look as pretty as a picture on the (designer) crockery, then head to exquisite estate Delaire Graff in South Africa’s Cape Winelands. Squid ink cured yellowtail with tequila and lime jelly, beef with basil mousseline and creamy butternut purée, and perfectly-prepared soufflés look as if they’ve fallen straight from heaven…. And that’s just the lunch menu. Designed by Zambian head chef Jason Njobvu, the menu at Chinzombo in Zambia’s South Luangwa is as downright tasty as the lodge is beautiful. After a day of game drives, surprises like peppered beef carpaccio (made from locally sourced Zambian beef nonetheless), homemade ravioli and delectable triple chocolate mousse cakes await, accompanied by harrumphing hippo and splashing elephant in the river below. Days at Kaya Mawa are spent snorkelling the translucent waters of Lake Malawi and relaxing aboard your private catamaran. So, how do you top that? By dining on chef Richard Greenhall’s fabulous creations, of course. Think fresh salads of seared tuna, homemade flatbreads and spicy dips, and Asian-style grilled chambo. Oh, and perhaps you’d like a traditional dawa (honey, mint & vodka cocktail) with that too… The incredible view is complementary. Dining at Cape Town’s Ellerman House is an exquisite journey of art and food, storytelling and wine. The signature experience is a pairing of the finest South African wines with tapas bites or a three-course feast, celebrating the rich culture of the Cape. Expect everything from barbequed mealies to glorious Cape Malay curries, and don’t forget to feast your eyes on the glorious views over the Atlantic Ocean either. It’s not so much about the taste of the food at Nairobi’s Giraffe manor (but we can confirm it’s rather delicious), but about your fellow dining companions – and they would be the herd of gregarious Rothschild giraffe, often to be found poking their long necks through the windows of the breakfast room. Now that really does bring a whole new meaning to ‘How would you like your eggs in the morning?’! It’s a safari lodge for foodies – heaven. We’re not saying we’re saving the best until last or anything, but what if we told you that uber-lodge Singita Lebombo had enlisted the help of top Cape Town chef Liam Tomlin (of Chef’s Warehouse fame) to redesign their menus? Expect his trademark tapas dishes to make an appearance, cooked using only the freshest of fresh ingredients, and snack fridges full of mini terrines and pots of parfait to nibble on. At Royal Malewane, the food certainly isn’t something to be devoured before falling into bed. 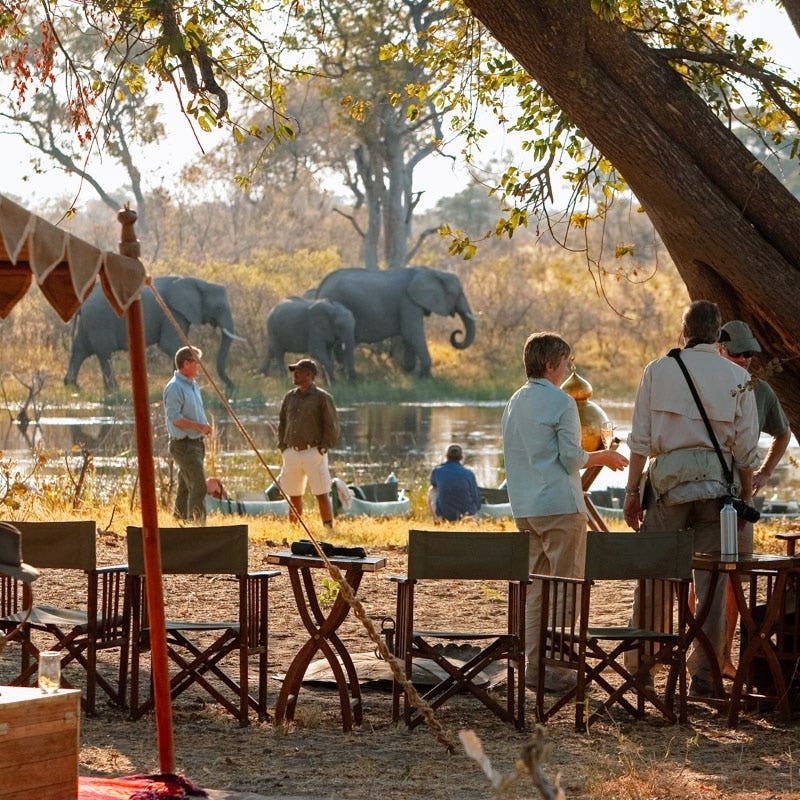 Eating is a delectable, sensory adventure, designed to complement every aspect of your safari. Think Afternoon Tea, served on delicate floral plates on the veranda, overlooking the bushveld; an aromatic Moroccan banquet under the billowing Bedouin Tent; or a six-course fine dinner, accompanied by the sounds of the African night. A must on our safari lodges for foodies – list. On a farm with a magnificent eight-acre kitchen garden, stuffed to the brim with giant orange pumpkins and curly courgettes, glossy mulberries and pink pomegranates, you know the food’s going to be good. And at Babylonstoren, it’s phenomenal, with dishes bringing a new meaning to the term ‘farm-to-fork’: straight-from-the-veggie-patch salads and fresh juices (pear, basil and green pepper anyone?! ), meaty mains and lip-smackingly brilliant desserts, all served in a converted cow shed. For a camp in one of the most remote places on earth, you’d be forgiven for thinking lunch might consist of a jam sandwich. Well, at Jack’s Camp, the only jam you’ll find is for ladling on to freshly-baked scones at Afternoon Tea! And that’s only a part of the sumptuous treats in store – start your day with the best Eggs Benedict in Botswana, and end it with a three-course, damask table-clothed feast under the stars. Recently voted the best lodge in Africa for its cuisine in the 2015 Safari Awards, Jamala is the baby of native chef Nico Verster, whose innovative creations are influenced by time spent in the UK, Africa, the Middle East and Asia. Dine alfresco beneath Africa’s ink-rich skies, cut with the brilliance of a million stars. Food aficionados can indulge in modern gastronomic treats served with the chic colonial charm and grace that is unique to Jamala Madikwe. And very well deserved finish to our safari lodges for foodies – list. Get ready for an Insta-Vacation!